I will admit there is a slight chance we are biased, but if you ask anyone here, Blue Compass is an unbelievable place to work. We try to share the excitement and fun-loving atmosphere of our office in our blogs and on our social media channels, but it is hard to do this place justice. So I am going to break it down for you with the Top 8 Reasons to Work at Blue Compass. Blue Compass has set a high standard for themselves since opening in 2007. From day one, the company has thrived on word of mouth and the satisfaction of their clients as their sales force; this comes from employing the best of the best. The median age in our office may be younger than many agencies, but when leadership is conducting interviews, they know the exact qualities and skills they are looking for in their future team members. Our talented team members return quality results. Without them, we would not have been able to achieve some of our notable awards including the Business Record's Best Web Developer in Des Moines, National Healthcare Advertising Awards, Women of Innovation Awards and many more. This talent helps our clients and staff grow personally and professionally every day! I think one of our Account Executives, Melissa Sporrer, explains it best! "The positive vibes from the Blue Compass team make it easy coming into the office every single day! We all have our strengths, but I think it's pretty cool that everyone works together to get the job done - even if it's not their responsibility." Melissa is right; we work as a team to meet our goals and the goals of our clients. Every person in the office has a talent and specialty they bring to the table. We can bounce ideas off of each other, and learn from one another's expertise to achieve the best results for our clients. When I first joined the team, I wondered how Blue Compass managed to avoid competition among team members. With five account executives, eight digital marketing team members, three front-end developers, five back-end developers as well as interns and bosses, it would be easy for the office to turn into a cut-throat competitive environment where everyone is scrambling to work with the best clients, but that is not the case. All of our clients are important and exciting to work with, and instead of being wary of each other and competing, we use our numbers to work more efficiently and as a team. I have been at Blue Compass for almost a year and a half, and every day my teammates are willing to answer questions for me, build me up and help me become better at my job. I will never cease to be amazed by the talent, patience, and kindness of the individuals I work with. At Blue Compass, we think of our relationships with our clients as partnerships instead of a client/vendor relationship. If the client succeeds, Blue Compass succeeds and vice versa. Think about it, if a social campaign run by Blue Compass performs well we see a high engagement rate, click-through rate and an ample number of conversions. These are all good things for the client; they are getting the desired traffic to their website, individuals taking the desired action on a page to achieve the conversion, and their brand awareness grows with engagement rates! Everyone works toward the overall goals and ambitions of Blue Compass and their clients. The open layout of our office is conducive to working together and collaborating on day-to-day activities. 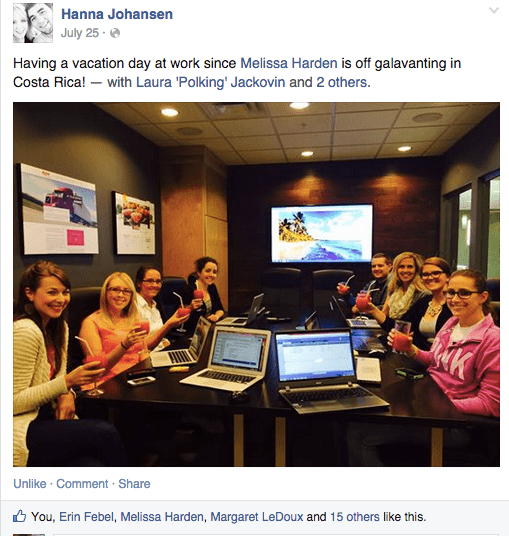 This collaboration extends beyond individual teams and involves everyone in the office. Company Co-Founder, Drew Harden explains this open work environment well. "We believe that a boss shouldn't work above their employees, but alongside the team. One of the reasons I love working at Blue Compass is our incredible team of web experts who I get to collaborate with every day. 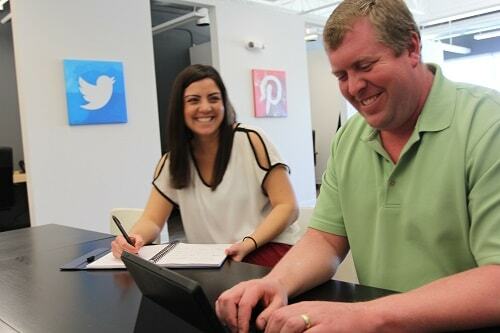 They care deeply about our clients, each other, and the exciting world of digital marketing." One of the key aspects of internal collaboration is making sure everyone is on the same page. We successfully accomplish this by holding regular client based team meetings that allow everyone who works with a particular client to sit down together and go over what goals have been accomplished in the past month and what to expect moving forward. Each Blue Compass team (yep, they are called teams, not departments) also holds a weekly or bi-weekly meeting. This allows everyone to share what projects they are working on, look at what has been successful for various clients and how we can implement that on other accounts. As you may have already guessed, in many ways, Blue Compass is the exact opposite of a corporate environment. Everyone here is important and has a voice. The Leadership team has an open door policy and welcomes everyone in the company to come to them with comments, concerns, thoughts and suggestions. No one has to go through red tape to gain access to anyone or anything in our office. As an employee who started my first full-time job at Blue Compass, it was reassuring to know that everyone here, from the company owners to my peers, wants me to succeed and is invested in helping me do my job to the best of my abilities. The non-corporate attitude extends even further. In the kitchen, we have two fridges; one is for lunches and the food that team members want to keep at work and the second is constantly stocked with soda, water, tea and more! If coffee is your thing, we have you covered there as well with a cabinet dedicated to K-Cups for our office Keurig. Another "big benefit" of our smaller company is our regular team lunches. We enjoy any occasion to celebrate, whether it is a birthday or a welcome lunch for new team members! As our office grows, our team lunches have developed into quite the event. We enjoy a few rounds of trivia during which team members play for a chance to win a gift card to a local restaurant. Let's not forget the casual dress code in the office, too! If you keep tabs on our Facebook page, or other social media profiles, you most likely will have seen a post about our infamous Fun Fridays! Ben Odam, one of our talented Front-End Developers, says, "I love working at Blue Compass because of our skilled team and fun work environment. Everyone works very hard, but we still kick back and have fun." He is right! We do like to have fun! If it is a busy week, we will congregate around the lunch table or in the conference room and finish up tasks while enjoying each others' company and a beverage of choice. There is also the occasional Fun Friday that involves snacks, video games, replaying office YouTube videos and much more. One of my favorite examples of the more creative Fun Friday has included singing telegrams, and, yes, this has occurred more than once! Earlier this month we had a Singing Granny known as Anny come in to wish Drew and Cary a Happy Boss's day. I think I speak for all that this was a memorable experience for everyone involved. We also have the opportunity to participate in company or team outings a couple of times a year. For the last two years, Blue Compass had the chance to sponsor and participate in the Des Moines Golden Circle Games. This year, we proudly took home the trophy for third place in the costume contest. Our team also enjoys an annual trip to an Iowa Cubs game! Everyone looks forward to these opportunities to get out of the office and spend quality time with each other. These are just a few examples of the events that occur in our office, where things are always interesting and exciting! At Blue Compass, we are proud of our Des Moines roots and like to support and work with local organizations. Positivity and humility are key to Blue Compass' core values, and we like to extend these values outside of our office walls. We aren't afraid of getting dirty! We have had the opportunity to work with Rebuilding Together to help lower income families around Des Moines. Blue Compass is also pleased to partner with Orchard Place, Blank Children's Hospital and Rally Against Cancer to help bring awareness and assistance to multiple needs in our community. It does not matter what team within Blue Compass an employee works within, the guidelines and standards for what is new, trending and modern are always changing. So it is important that we all stay up-to-date with the latest trends and changes in our fields. Blue Compass encourages everyone to participate in continued learning and training. This training and learning occurs in many ways within our office. From team members attending local or national conferences where they can learn from the best of the best and bring back fresh ideas to inspire each other, to working lunches where we share the most recent changes within our field that will impact our daily work and clients efforts, we want to be sure we are constantly prepared for the latest and greatest technologies, platforms and processes. Another way we like to stay connected in our office is by holding regular show-and-tell meetings. Stay with me a minute! When I attended my first show-and-tell I did not know what to expect, we all work together and collaborate every day - what are we going to talk about? But they turn out to be some of the most productive work sessions we have. Each team is able to share what new techniques, features or approaches they have brought to their projects. This helps everyone else in the office understand the full host of capabilities we have and can help prepare us to offer even more creative and successful solutions for our clients. Almost every show-and-tell ends up turning into a multi-meeting event because we want to learn how to do or how to use one of the new features or approaches for other projects and clients in different ways. So Why Work at Blue Compass? Personally, I can't sum it up in just one thought, and I feel like this article only scratches the surface; so I will leave that to one of our experts. Whether we have an open position on our website or not, we are always looking for great talent. If you think you have a dynamic, digitally-based skill set, then don't hesitate to contact us. It could be one of the best moves you'll ever make. Katrina Reger enjoys helping advance the online presence of Blue Compass' clients by taking an integrated and comprehensive digital marketing approach. She manages the growth and learning of the digital marketing team, ensuring the team stays updated and trained on the latest in the industry trends. Katrina graduated from Drake University, where she achieved a Bachelors Degree in Marketing with a concentration in direct and interactive marketing.